Farm Sanctuary’s seasonal tour guide positions offer a unique opportunity to live and work with a team of committed staff and volunteers focused on advocating for farm animals. Tour guides assist with all aspects of our Visitor Program activities and play a key role in educating the public on farm animal issues and a vegan lifestyle. 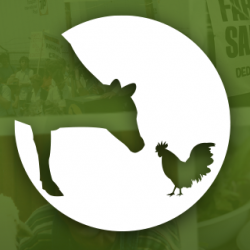 This position is an excellent opportunity to gain skills and experience in animal advocacy work. Responsibilities & Duties: Providing visitor center and tour program needs from May through October Conducting public and special tours using script provided Staffing gift shop Providing customer service to guests Daily cleaning responsibilities Assisting with Bed & Breakfast Program, including regular breakfast setup, cleanup, and housekeeping responsibilities Assisting with on-site sanctuary events and outreach projects Qualifications: Excellent interpersonal skills Knowledgeable on farm animal and vegan issues Commitment to Farm Sanctuary’s mission and pursuing a vegan lifestyle Excellent communication and outreach skills Hardworking and dependable Able to easily communicate with various audiences Detail-oriented Resourcefulness and ability to work independently Willingness and ability to perform physical labor and moderate lifting Valid driver’s license and clean driving record Job Specifications: Full-time temporary position available late April through end of October; one position available through December 31. Candidates only available May through August will also be considered. Position requires regular weekend and holiday hours Starting wage is $12 per hour for on-site staff, $13.50 for off-site staff Limited shared on-site housing available at no cost All interested applicants are required to complete Farm Sanctuary’s Employment Application and submit a cover letter connecting their experience to this specific position. Instructions for sending supplemental materials (resume, references) will be provided within the application. For questions or to request a copy of the employment application by mail, please contact humanresources@farmsanctuary.org .